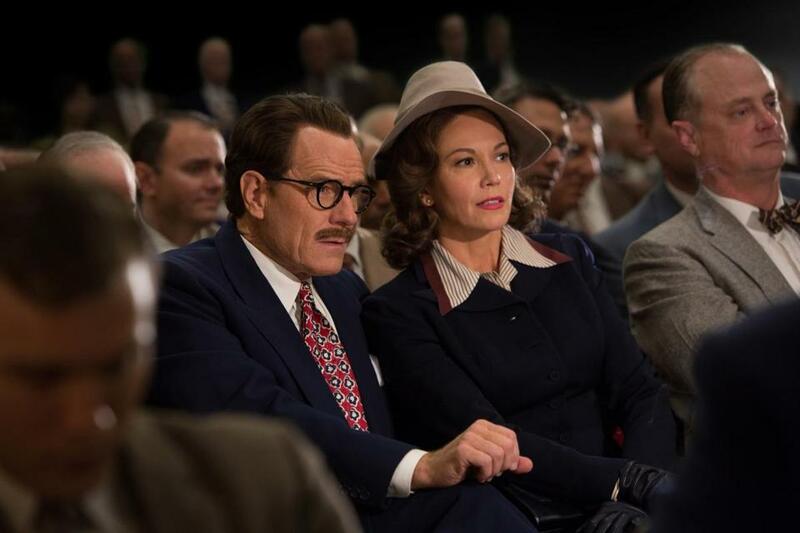 “Trumbo” the movie dramatizes the story of Trumbo the man: Dalton Trumbo (1905-76), Hollywood screenwriter, defiant victim of the post-WWII blacklist, and nearly as big a legend in the film industry as he was in his own mind. He is played with delicious swagger by Bryan Cranston, whose post-”Breaking Bad” career has addressed itself to the marvelous monsters of biography — this film and his recent turn as LBJ at the American Repertory Theater and on Broadway. There are other actors in the movie, but most of them fade into the upholstery under the combined assault of Cranston-Trumbo. It’s a fun movie and an overbearing one, patly written and crowded with enjoyable faces. It offers useful and still-necessary moral lessons about remaining true to one’s conscience in times of fear and stupidity (i.e., now). It is a labor of love made by Hollywood insiders, and if it never seems to draw a breath of air from outside the film industry, it may be because its makers rarely do. But it’s a rollicking good show, with Cranston’s Trumbo a character of the first order: an elitist who knows how to write scripts for the masses. “Trumbo” settles in as the war is coming to a close and the witch hunts begin against anyone who is now or has ever been a member of the Communist Party. That includes many of the screenwriters, who come into the crosshairs of the House Un-American Activities Committee in the late 1940s. Under the direction of Jay Roach, who continues to grow beyond his “Austin Powers”/“Meet the Parents” roots, “Trumbo” brings what Lillian Hellman dubbed “scoundrel time” into sharp relief. The writers and directors who came to be demonized as the Hollywood Ten strategize about their testimony on Capitol Hill even as the forces of the Hollywood right mass against them: The drawling John Wayne (David James Elliott), MGM’s bathetic Louis B. Mayer (Richard Portnow), and — the biggest ogre of them all — gossip columnist Hedda Hopper, who is brought to juicy, bigoted life by Helen Mirren. The film presents Trumbo as the hyperactive cheerleader of the opposition, raising relief funds and fighting the good, angry fight even as writers like Arlen Hird (Louis C.K.) fall prey to depression and illness. No one expected the Hollywood Ten to actually do jail time, yet in 1950, there Trumbo was in federal prison in Ashland, Ky., serving 11 months for contempt of Congress. It’s when he gets out that “Trumbo” gets really interesting. Blacklisted from writing for the movies, Trumbo and his fellow pariahs churned out screenplays under various pseudonyms, and Roach has a high old time illustrating how much work that took, with separate phone lines for each alias and Trumbo in his bathtub banging out a new script every three days, most of them for a poverty row studio run in the film by a roistering John Goodman. Trumbo won two Oscars while officially unemployable, one for the classic “Roman Holiday” — his “front” Ian McLellan Hunter (Alan Tudyk) accepted the award — and a second for the less-remembered “The Brave One,” credited to the mythical “Robert Rich.” Half the town knew who had written those scripts, and no one talked. The final act, set in 1960, is very nearly played for farce, with Kirk Douglas (a sly Dean O’Gorman) at the front door hiring Trumbo to write “Spartacus” and director Otto Preminger (Christian Berkel, hilarious) on the back porch begging him for rewrites on “Exodus.” When Douglas put Trumbo’s name in the credits, the blacklist was officially broken. According to this film, Dalton Trumbo was one of those people forever talking up the common man while treating everyone in his life as extras. “Do you have to say everything like it’s going to be chiseled in rock?” asks C.K.’s Hird in exasperation in one scene. The movie portrays the writer as so invested in his causes and his own drama that he neglected his wife, Cleo (Diane Lane), and his children, including oldest daughter Niki (played by Elle Fanning once the character hits adolescence). The movie neglects them, too — I can’t think of the last time the great Lane was this underserved. But Cranston’s performance is the motor that runs “Trumbo,” and that motor never idles, never flags in momentum or magnetism or idealistic scorn. At its entertaining worst, the movie’s a high-spirited game of Hollywood dress-up. When it clicks, it’s a work of moral indignation as only Hollywood can make it: slick, compelling, and cloaking democratic ideals in the raiment of outsize personality. If Dalton Trumbo hadn’t existed, he would have had to make himself up. Come to think of it, maybe he did. Directed by Jay Roach. Written by John McNamara, based on the book by Bruce Cook. Starring Bryan Cranston, Diane Lane, Louis C.K., Helen Mirren, Elle Fanning, John Goodman. At Boston Common, Coolidge Corner, Kendall Square. 124 minutes. R (language including some sexual references).